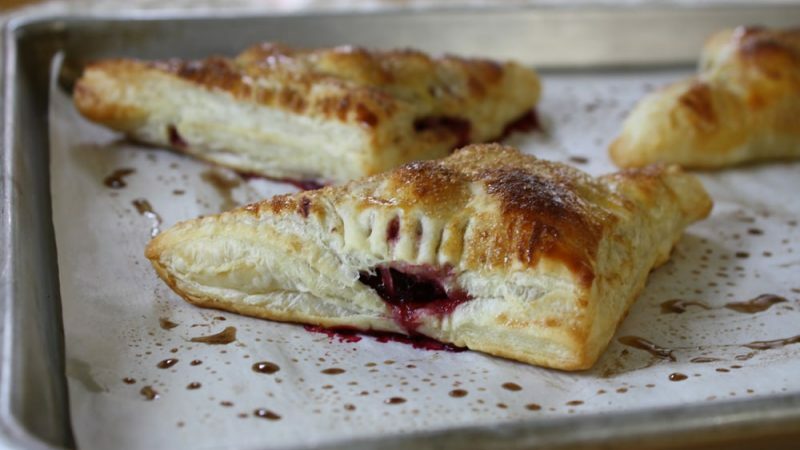 These flaky pastries burst open with the delicious taste of berries and apples. The vanilla accent is the perfect contrast to the tangy fruits it contains. In a mixing bowl, lightly toss the diced apples and blackberries with Rodelle Vanilla Sugar, salt and Rodelle Vanilla Beans. Onto a clean kitchen counter, place the puff pastry sheets and cut into 4˝ x 4˝ squares (if frozen thaw the puff pastry according to package directions). Preheat your oven at 450 degrees Fahrenheit. Place on a baking sheet parchment paper or a silicone mat, space evenly the pastry squares, and spoon 2 to 3 tbsp of fruit mixture on the center of each square leaving at least an 1˝ space clear from the edges. Bring the points together into a triangular shape, pressing to seal the edges (you may use a fork for sealing). When the turnovers are sealed, with a fork make some holes of the top of each turnover, lightly brush the top with the egg yolks. Sprinkle the top of each turnover with ¼ tsp of Rodelle Vanilla Sugar. Bake the turnovers for 20 minutes, rotate the baking sheet then continue to bake for 5 or 10 more minutes or until the turnovers are golden brown and cooked. Let them rest for 15 minutes in order to cool them down.